Bike stands with ads. Outdoor bike stands. You can find what you need in our range of innovative bike stands with ads. Our bike stands are made from galvanised steel and fixed to the ground. Installation process is quick and easy. Additional advertising banner draws attention and makes bike stands unique. Customised banners can serve various goals and be an effective way of promotion. 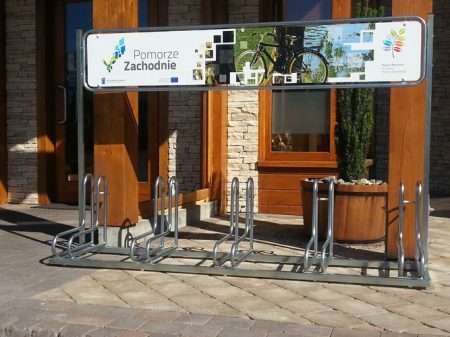 Our bike stands with ads are also space efficient and durable. They can withstand severe weather conditions over long periods of time. The whole construction is user friendly – it’s really smooth to operate and can accommodate various types of bikes. Bike stands’ size makes them perfect for local needs. 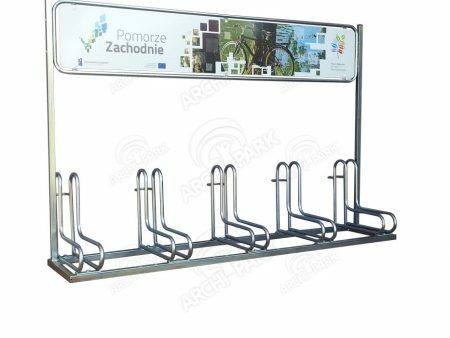 This type of cycle parking system works great in recreational areas, as well as local culture centres and corporate infrastructures.